Cost: $35.00 online reserved at the seminar or $45.00 at the door. There is no guarantee there will be enough seminar deliverance prayer course manuals at the day of the seminar on healing and deliverance. A scripturally sound healing and deliverance seminar deliverance prayer course manual, for those who want to learn how to pray over themselves after seminar or just want to own a copy. You will learn how to avoid traps and snares of the enemy and how to close doors to the demonic realm and demonic influences. Overcome demonic oppression, breaking demonic strongholds, generational curses, etc. Also, covers spiritual roots to disease and how to walk with the Lord’s covering or hedge of protection against diseases. The Garden of Eden was a hedge of protection. 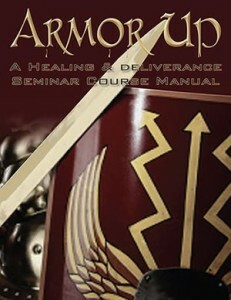 You can also buy the digital download seminar deliverance Prayer Course Manual for only $20.00.